Objectives: As diversity management activities become more prominent worldwide it is important to understand psychological reactions to them to ensure success, but empirical evidence is lacking. This study investigated employees' and managers' intentions and behavior to promote cultural diversity at work in a variety of organizations in the Netherlands, using Ajzen's theory of planned behavior. Method: Predictors of intentions to promote cultural diversity at work (N = 670) and actual behavior after 6 months were assessed among managers and employees using self-reports in a 2-wave survey design. Participants' average age at Time 1 was 38.26 years (SD = 11.86), 56% was female, and there were 78.1% Dutch ethnic majority and 21.9% ethnic minority participants. 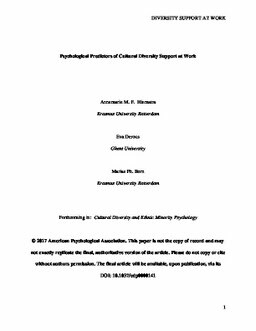 Results: Attitude to cultural diversity promotion at work and perceived behavioral control (PBC) related positively to both individuals' intentions to promote cultural diversity at work, which in turn predicted behavior. The strongest driver, however, was attitude. Managers' reported PBC and behavior were higher compared to employees. Conclusions: This study supported the applicability of the theory of planned behavior to predict intentions and behavior to promote cultural diversity at work. With an increasingly diverse workforce, this study aimed to advance our understanding of drivers of individual reactions and behavior to support cultural diversity at work.